It almost feels like this football season hasn’t got going yet, but here we are approaching the halfway point. 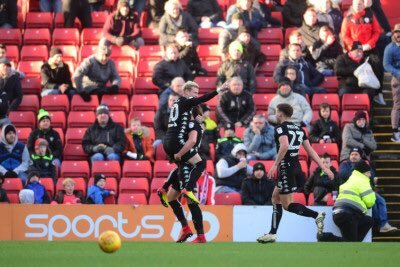 The blistering start from Leeds swiftly turned into a stutter and in recent weeks it has levelled out a bit, but add in the numerous international breaks and it has all been a bit stop/start and it is hard to draw any conclusions. Yet as I write, Leeds have played 20 games and will soon be facing the home straight to the end of the season once again. December is traditionally the time when the league table really starts to take shape. The inhabitants of the play off places at the turn of the year are quite often the same ones at the end of the season; unless one of them is Leeds of course, but it’s up to us to change that. Right now we are two places and five points outside the play-offs zone and face a pretty favourable run of games in December, so you could conclude that Leeds are quite well placed for an assault on the top six in the second half of the season, and December could see them send out a message to the rest of the division. The last month has seen a bit of a turnaround in the club’s fortunes after a pretty horrific October. While there were two away defeats at Brentford and Wolves, Leeds won their only home game against Garry Monk’s Middlesbrough and also notched a rare Yorkshire Derby win at Barnsley. This has stopped the rot and instilled a bit of belief in both the team and the management, something that had gone badly AWOL and left us all a bit confused after such a brilliant start to the season. It seems that almost every game is either live on Sky or on a beamback at Elland Road at the minute, so we are certainly feeling a part of the action at the pub, as fans can’t resist the urge to pop in for a pint before and after the game, to savour that matchday atmosphere they know and love. Naturally we will always welcome this and whenever and wherever Leeds United are playing there is always someone at the Old Peacock cheering them on. November has been a pretty quiet month at the Old Peacock though, with just the one home game against Middlesbrough, and that on a Sunday lunch time. We had to forego our usual pre-match live band in the beer garden due to the early kick-off time, and of course we couldn’t serve our traditional Sunday lunch either, but it was all worth it as the lads came straight out of the traps and secured a much-needed 2-1 victory. It was great to see a big crowd again and the club’s efforts to re-engage the fanbase certainly seem to be paying off. We have always welcomed families at the Old Peacock, but more and more we are seeing the younger generation coming to the games with parents and it is fantastic to see. We are hoping this continues into December too, and for once the fixture computer at the Football League has been pretty kind to us. Okay, Sky Sports are responsible for the Aston Villa game being moved to a Friday night, but after that we have Saturday 3pm home games on two successive weekends, all in the run-up to Christmas. It’s to be hoped that you guys are doing all your Christmas shopping online, because there won’t be many trips to the shops with Leeds being at home two Saturdays running. Norwich City are the visitors on Saturday 16th and then Hull City come to Elland Road on the 23rd. With Leeds seemingly back in the hunt for the play-offs these are sure to be big occasions and we will certainly have the welcome mat out for the 30,000-plus crowds expected. Leeds then see the year out with away games at Burton Albion and Birmingham City, before Nottingham Forest come and visit on the first day of 2018. But let’s not worry about that for now. With two Saturday 3pm fixtures lined up, we are busy getting stocked up and all our staff prepared for what are sure to be two mammoth occasions in the run-up to Christmas. Speaking of Christmas, as usual, our Christmas Day menu sold out in no time at all and we are now fully booked for the big day. We have always felt that the festive season is about more than just getting together on the 25th however, so we designed another Christmas menu for the run-up to Santa coming and this has proved really popular in recent years. 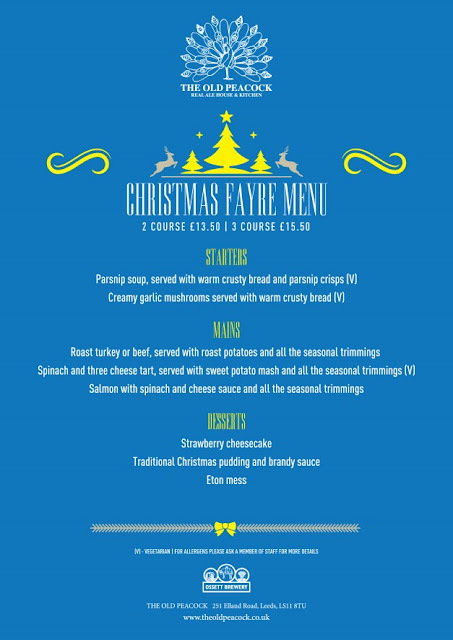 More and more people use the festive season to get together with friends and family they perhaps don’t see too often, and of course there are numerous works parties at Christmas time, so we designed our Christmas Fayre menu specifically with this in mind. Now you can sample a flavour of Christmas at your favourite venue and with your favourite people. It will save you washing up and it certainly won’t cost you the earth. At two courses for £13.50 and three courses for £15.50 you will be hard pushed to find better value anywhere in Leeds. There is a choice of traditional Christmas dishes mixed with some old classic favourites and over the years we have hosted some memorable evenings with people who keep coming back year after year. 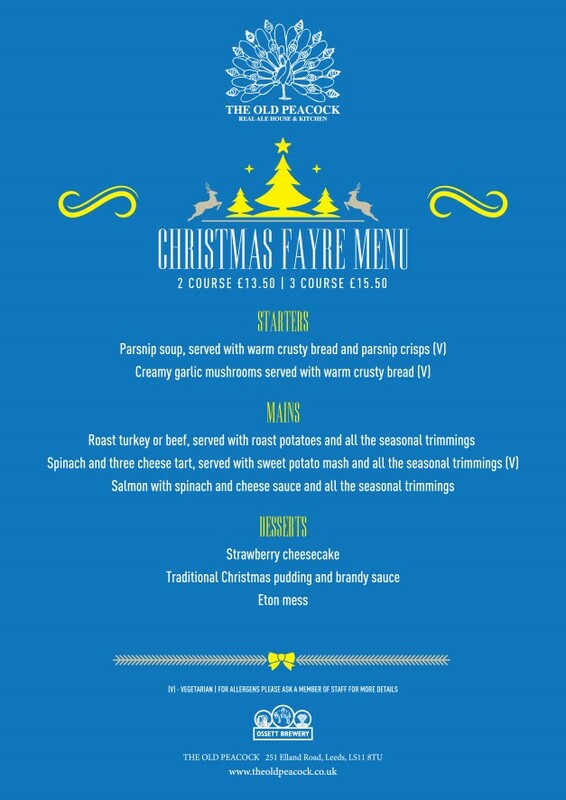 Please call in and speak to us in person or phone us up (0113 2715962) to book a table for the Christmas Fayre menu and we will make sure we can accommodate your party. So another year at the Old Peacock comes to an end. It has certainly been a busy one and we wouldn’t have it any other way. We hope to see you for the Norwich and Hull games and again at some point over the festive period, but we would also like to take this opportunity to wish a very Merry Christmas and a Happy New Year to all Leeds United fans and to all our customers everywhere.